WASHINGTON – Prior to Tuesday night’s game at Nationals Park, Pete Mackanin said he finally had a “theory” on how his team could pitch to the best hitter in baseball and have some success. But perhaps implementing on the field wasn’t anywhere near as easy as putting it together in your head. Mackanin isn’t going to reveal his strategy, but if you follow former Phillies manager Charlie Manuel’s basic rule, “watch the game,” you could at least come away with your own theory on Mackanin’s theory: when it comes to Bryce Harper, who has as many home runs (nine) as strikeouts three weeks into the season, the best plan is to choose your battles wisely. Harper, who homered in all three games the two teams played in Philadelphia a week and a half ago, came to the plate five times on Tuesday. He was intentionally walked twice; another time Phils starter Vince Velasquez fell behind after two pitches and basically did the non-intentional walk-intentional walk thing. “I’m going to walk him every time I face him this series,” Mackanin said jokingly. It might not be the worst of ideas when you consider Harper is probably on pace for 60 home runs this season, and currently has a slugging percentage 130 points higher than anyone else in baseball. "It had a lot of drama to it, that game with that guy," Mackanin said after managing to beat Harper and the Nationals on Tuesday night. Vince Velasquez referred to himself as a “former teammate” of Harper’s after the game. The 23-year-old Phillies pitcher and Southern California native said he played on a travel ball team with the Las Vegas native Harper when the two were “around 12” years old. “My uncle used to get guys from all over the place,” Velasquez said. In their first head-to-head matchup in the big leagues, Velasquez came at Harper with his fastball, but keeping them just off the plate. Harper didn’t bite. Bryce Harper's first at-bat against the Phillies on Tuesday night. 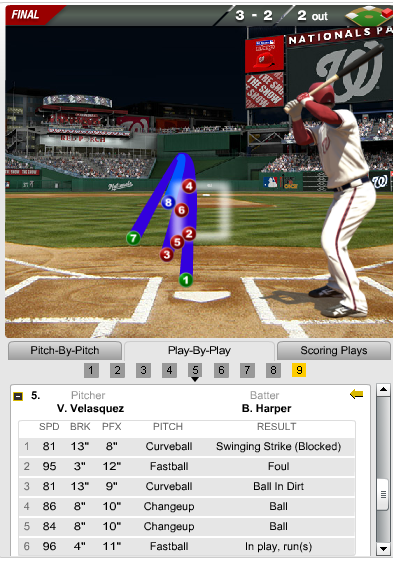 After Harper fouled off the third pitch, Velasquez didn’t give him anything else close to the strike zone. And so, with two out and no one on, Harper strolled to first base with his first walk of the game and as a harmless base runner for the Phillies. But credit Harper’s discipline, too, said his former boyhood teammate. “His approach is just flat out ridiculous,” Velasquez said. The Phillies were up 2-0 and after a one-out single from Michael Taylor and an errant pick-off throw from Velasquez, Washington had a runner in scoring position with two outs. Macknanin made the easy call: walk Harper. Velasquez gritted his teeth and went along with the bosses orders. The ultra-competitive pitcher didn’t want to come across as someone giving in, however, so he used his pitching hand to gesture to Harper that, hey man, go take first but this isn’t my idea. “I was like, ‘Hey, it’s their call, not mine,’” Velasquez said of swiping his index finger toward first base for Harper to see. It’s probably never a good idea to load the bases for a team’s clean-up hitter, but it may have been (which is easy to say in retrospect) during the fifth inning when the proverbial wheels began to come off for the Phillies. With one on and one out, Anthony Rendon hit a ground ball to Maikel Franco, who botched a potential inning-ending double play. It brought Harper to bat with two on and two out. Unlike two Sundays ago at Citizens Bank Park, Daniel Murphy, the owner of the third best OPS in baseball three weeks into the season, was not batting behind Harper. And that was the reason Mackanin said he didn’t want to walk Harper in Philly. Bryce Harper's at-bat during the fifth inning against the Phillies on Tuesday night. But rather than walk Harper for the third straight time and take their chances with Ryan Zimmerman, Velasquez and the Phillies went at Harper, who hit a scalding single to left-center to score the Nationals first run. Velasquez was out of the game, replaced by reliever David Hernandez. The situation was almost the exact same scenario as the second time Harper came to the plate Tuesday night: runner at second (first base open), two outs, with the Phillies holding a two-run lead. Hernandez was told to walk Harper intentionally. He did so, and then struck out Zimmerman on five pitches, the final a knee-bending curveball belt high and on the inside corner of the plate. All Jeanmar Gomez had to do was work a perfect ninth inning to avoid Harper. But nobody is perfect (even Brad Lidge had just 24 perfect saves – three batters faced, three outs – in 2008). Anthony Rendon hit a two-out single off Gomez and Harper, who hit a go-ahead home run off Gomez in the 10th inning at Citizens Bank Park nine days earlier, dug in against the Phillies closer. So why not walk Harper again? After all, it was just two days earlier when Harper standing in the same batter's box with the game on the line and delivered in a big way. "I wasn't going to walk him and put the tying run on second where a single could tie the game," Mackanin said. As Gomez began to battle Harper, Velasquez was going through his postgame workout routine and barely moved a muscle while watching what would be the game’s final at-bat play out. Harper spit on the first pitch from Gomez, a sinker in the dirt. He took a healthy cut on the second pitch and swung through it. That’s something Harper hasn’t done too much of this year: his 83.3 swing percentage (how often he swings at a ball and makes contact) is up from 75.2 in his MVP year of 2015, and from 72.7 in 2014. 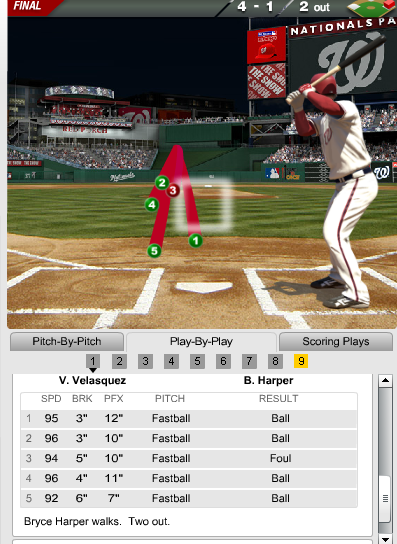 Harper fouled off the next four pitches. Gomez was trying to avoid doing that, of course. 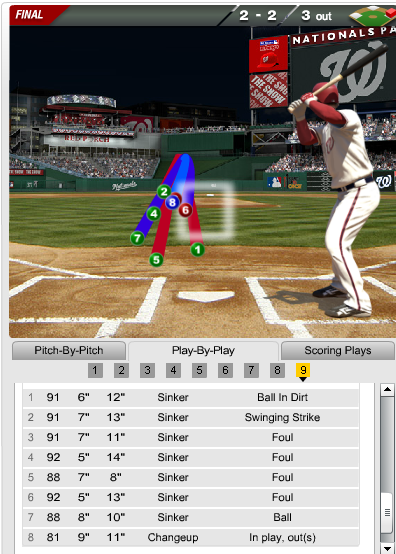 And so on the eighth pitch of the at-bat, after basically throwing a slight variance of the same pitch seven straight times, Gomez went with a changeup, an enticing pitch for Harper, but one also not left over the heart of the plate. Harper's final at-bat against the Phillies on Tuesday night. Harper hit a weak ball to third base, Franco fired to first, game over.